In an ever increasing world of digital design and printing, plain glass windows can now come alive with the most vibrant and intricate designs imaginable. 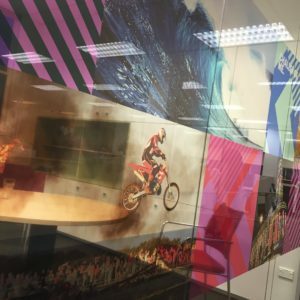 With a vast a ray of self -adhesive medias available on the market today, we are able to produce stunning visual effects through transparent and opaque colours on the same piece of glass. 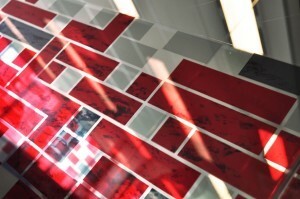 Optically clear films open a whole new world of graphical glass designs. From the transparent look to full colour photographic realistic imagery that will support your brand and create an unforgettable experience for your clients and staff. We’ve even created video-based window projection screen solutions using a rear-projected film, ideal for situations where you want to change out content on a regular basis or create video footage to bring your windows alive. A wide variety of different textures, transparency and patterns are available as an off the shelf option to create the sandblasted look of glass. These films are available in PVC free materials which support green star buildings and sustainability. The effects that can be achieved from double layering and vector cut logos or shapes become outstanding features of your interior fit-out in your home or office. With our wide range of materials and our design culture, your health and safety decal can look fun and funky and will meet OSH requirements.